Strengthen in situ conservation of breeds of the Raika and include them in the BMC being initiated by the government. Calls on the Secretariat of the UN Convention on Biological Diversity, specifically under Article 8(j) of the Convention, to recognize the contribution of our traditional lifestyles to the conservation and sustainable use of biological diversity in Rajasthan; and calls on the UN Food and Agriculture Organization to recognize the importance of our animal genetic resources and to recognize livestock keepers’ rights. 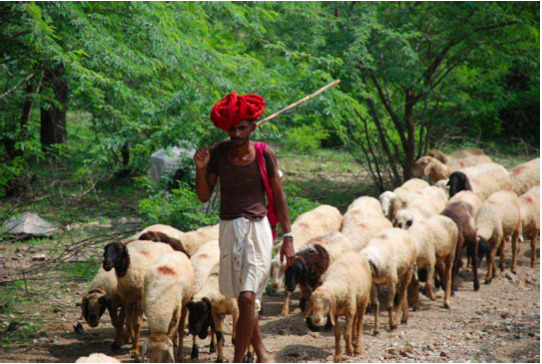 Where we live: We are the Raika, an indigenous pastoral community who live in Rajasthan, North West India. We number about 1m people, with the Maru Raika living across the State and the Godwad Raika living in Pali, Jalore and Sirohi. 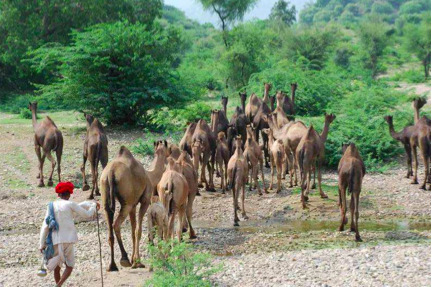 Despite the arid climate and the region’s dryland ecosystem, we have lived in the region for over 700 years rearing unique livestock and acting as custodians of the local environment. Our origins:At a spiritual level, we believe that we were created by Lord Shiva. The camel was shaped by his wife, Parvati, and it was brought to life by Lord Shiva. But the camel’s playfulness caused a nuisance, so Lord Shiva created the Raika from his skin and sweat to take care of the camels. Our spiritual universe is linked to our livestock breeding, and our ethnicity is inextricably intertwined with our breeds and way of life. 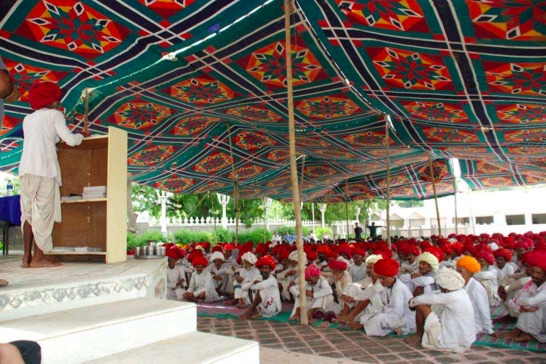 We have always considered ourselves a distinct indigenous community, a fact that is recorded, for example, in the 1891 Marwar census undertaken on behalf of the Maharaja of Jodhpur. Our traditional livelihoods: We are indigenous nomadic pastoralists who have developed a variety of livestock breeds based on our traditional knowledge and have customarily grazed our camels, sheep, goats and cattle on communal lands and in forests. This means that our livelihoods and the survival of our particular breeds are based on access to forests, gauchar (village communal grazing lands) and oran (sacred groves attached to temples). In turn, our animals help conserve the biodiversity of the local ecosystems in which they graze and we provide assistance to the area’s local communities. In this way, we see our indigenous pastoralist culture as both using and benefitting from the forests, in a virtuous cycle. Animal genetic resources: Through our interaction with the forests, gauchar and oran, and through selective breeding for generations we have created breeds that are particularly hardy, able to forage and digest rough vegetation, withstand the dry Rajasthani environment and to walk long distances – all attributes that “high performance” exotic breeds do not have. Local breeds need fewer inputs and are less susceptible to disease and are well-suited to harsh conditions. The animal genetic diversity they embody enables us to respond to changes in the natural environment, important attributes in the context of climate change adaptation and food security. Their genetic traits and our traditional knowledge associated with them will also be of use in breeding for disease resistance, and may provide us with other diverse economic opportunities under the forthcoming International Regime on Access and Benefit Sharing or a future International Treaty on Animal Genetic Resources for Food and Agriculture. Many of our breeds are intrinsically migratory, and cannot be stall bred. Just as our lifestyles are suited to the conditions they require to survive, these breeds are suited to our biocultural realities. Traditional knowledge: Our traditional knowledge relating to breeds and breeding has arisen from centuries of experience of tending these particular breeds in Rajasthan. We have traditional customs that ensure the genetic diversity of our breeds, such as the rotation of bulls between villages for stud. We have also developed extensive local treatment systems (ethno-veterinary knowledge) with which to care for wounded or ill animals, and much of this traditional knowledge is held by both the men and women of our community. We share our ethno-veterinary knowledge freely with other communities that own livestock and are perhaps the only veterinary care for livestock in remote areas of rural Rajasthan. Women also take care of the newborn animals, make decisions about the sale or transfer of our livestock and sell milk. Our animal products are totally organic, attributes that are highly desired in some parts of India. The wool of our animals is used for making carpets, rope and blankets and they also provide draught. Spiritual understanding of our breeds:Our breeds are more than just a livelihood. They form an integral part of our social fabric and are interwoven with spiritual meaning. A number of important holy days involve rituals that involve our animals and underscore the sacred ties between our livestock, the environment and our traditional knowledge. We are integral to Rajasthan’s forests, gauchar and oran. Our animals have contributed to the ecology of the region to such an extent that they cannot be separated from the “natural” state of the forests, gauchar and oran. As our animals graze, they provide manure to otherwise infertile ground. At the same time, the seeds in the manure have a higher chance of germination, provide gestation and increase the natural propagation of local trees. Because our animals consume the foliage on the ground, it helps to keep termite numbers low. The feeding on ground fall and tall grass has also lowered the incidence of forest fires. For generations we, the Raika, have acted as custodians of the forest. We have always fought forest fires, dealt with invasive species poisonous for animals (such as Angrezi Babul i.e. Prosopis juliflora and the Rukadi i.e. Lantana camara) and reported illegal logging and poaching. Our customary laws ban practices that degrade the environment, including the lopping of sacred trees, and heavy punishments are meted to community members who break the rules. Our grazing patterns are based on our traditional ecological knowledge and establish a strict rotation based on the seasons over a five year period. At the same we stimulate tree growth by our practice of lopping of selected trees, as well as by our camels that eat the twigs and leaves of the upper branches. Studies on our grazing patterns have shown stronger tree growth in areas where our livestock have traditionally grazed. Our livestock has become integral to the animal diversity in forest areas. Predators such as leopards and wolves have traditionally preyed on our livestock and we consider the resulting loss of livestock as a natural part of our integral relationship with the ecosystem. 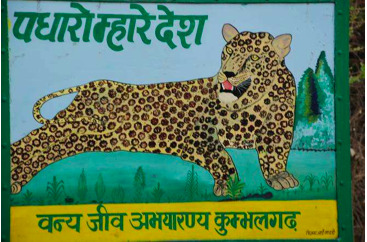 Studies in the Kumbhalgarh Sanctuary have shown how the leopard population in the region has been sustained by our livestock and the negative impacts caused by the exclusion of livestock from the Sanctuary which include increased encroachment by leopards into villages leading to dangerous conflicts. We also provide services to the villages near our grazing lands and migratory routes. We provide manure to farmers, either by keeping our animals on their land on a temporary basis, or by selling it to them directly. People from surrounding villages use the forest for a variety of needs, including collecting dry wood, fodder, agricultural nutrient inputs, medicines, thatch and famine foods. Villagers consider us to be their guardians in the forest, offering guidance and protection to them in an otherwise dangerous area. Members of our community use the forest for the collection of medicinal plants that are used to provide free health assistance to our community and to people in other neighbouring villages. Just as our breeds are unique because of the areas we graze them in, so the forests, gauchar and oran have evolved into particular kinds of pastoral based ecosystems because of our long-term interaction with them. We are integral to the forests, gauchar and oran: we cannot survive without them and they will suffer without us. We want to continue to graze our animals in forests, gauchar and oran, in a way that sustains the natural plant and animal ecology of these areas, maintains our diverse breeds, sustains our rich traditional knowledge. 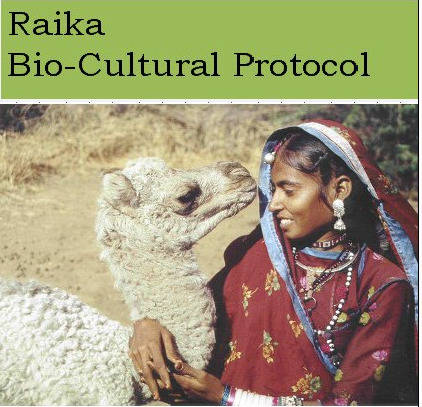 Our animal genetic resources and our associated traditional knowledge about breeding and ethno- veterinary practices are collectively owned by the Raika. We have customary laws that regulate decisions making in our communities. For issues that relate to all community members, we form a samaj (community) panchayat that is constituted by our elders who stretch from one to twenty four villages depending on the gravity and applicability of the decision. Our elders who constitute the community panchayat follow our customary laws and norms of decision making that have been followed for generations. Our community panchayat should be engaged any time outside interests take decisions that may affect our livelihoods or relate to our breeds and associated traditional knowledge. For example, before any of our access rights to customary grazing areas are altered we must be consulted. Also, where researchers or commercial interests want to access our animal genetic resources and / or associated traditional knowledge, we must be given all relevant information with which to take a decision and given time to discuss the issues within the community panchayat as our breed diversity and traditional knowledge are collectively held and their ownership does not vest in any single individual. In cases where we decide to grant access to our animal genetic resources or associated traditional knowledge, we have the right to negotiate a benefit sharing agreement that includes mutually agreed terms. we have the right to negotiate a benefit sharing agreement that includes mutually agreed terms. Despite this incredible genetic diversity and associated traditional knowledge that we have developed, we remain mainly landless people and are highly dependent on our customary grazing rights over forest and communal lands. Traditionally we have grazed our animals in Rajasthan’s forests and in the gauchar and oran over the monsoon (July-September). Our exclusion from the forests, and shrinkage of gauchar and oran severely threatens our entire existence and the co-evolved ecological system of these biodiversity rich areas that have been developed through generations of complex interplay between livestock, livestock keepers and the local ecosystem. 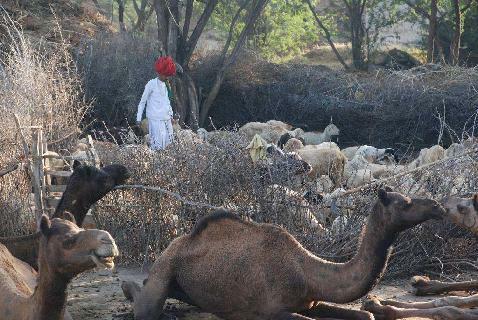 We have customarily grazed our livestock on a seasonal basis in Rajasthan’s forests for centuries. The Kumbhalgah Wildlife Sanctuary is a case in point. The Kumbhalgarh Wildlife Sanctuary is a 562 square kilometre range of reserved forest under the management of the Rajasthan State Forest Department. We have been historically provided with grazing permits which have over the last few years been revoked and all grazing in the forest has been banned without due process by the Forest Department. We were neither consulted about the decision, nor compensated in any way. We respect the need to conserve the Kumbhalgarh Sanctuary’s biodiversity. Better than anyone, we understand the importance of the ecosystem because it is has sustained our livestock and our communities just as we have contributed to its conservation. Our exclusion from the forest has deeply affected our livestock numbers and is having a negative effect on the forest ecosystem. We have experienced the same fate regarding the shrinkage of gauchar (village communal grazing lands) and oran (sacred groves attached to temples). These areas have become increasingly diverted for other economic development projects. It is ironic that we - the very people who for centuries have been the custodians of biodiversity and whose traditional lifestyles have developed and sustained the biodiversity of the region - are now being denied access to it based on a limited understanding of the complex relationship between us, our livestock and the local ecosystem. We are deeply concerned about the impacts that our exclusion from previously accessible communal areas for grazing our livestock is having on areas’ biodiversity, our animal genetic resources and our future. Biodiversity:Our exclusion from forested areas is changing the ecosystem and leading to a degraded ecology. The reduction in grazing is resulting in an excess of grass and foliage on the ground that is leading to an increase in the prevalence and severity of forest fires. The pits that are dug to inhibit the spread of forest fires are proving to be ineffective in combating this serious issue due to the dry grass that has begun to grow in these pits. The excess ground fall is leading to disequilibrium in termite numbers that can affect the health of the trees. At the same time, we are unable to act as custodians of the forest, so illegal logging, poaching and crimes are being committed in areas that we once managed according to our customary laws. The continual work we undertook to eradicate harmful or invasive species has ceased, and with it precipitous increases in plants that are either harmful to animals or risk destabilizing the local ecology. The reduction in available prey for wild predators has led to their encroaching on villages, causing conflict between communities and the wildlife. At the same time, we are unable to assist members of other communities who need to access the forest, which is reducing the ability of communities to benefit from the forests. Animal genetic resources: due to the significantly decreased amount of grazing lands available to us, we have been forced to sell significant numbers of our livestock over the last 5 years. We are literally being forced to sell our livelihoods to feed ourselves. Our camel stocks have been hardest hit, suffering a 50% decrease in the last 10 years, and this drop represents a significant threat to the survival of the breed. With the sale of our livestock goes our traditional knowledge. As our herds diminish, so does the transmission of breeding techniques, medicinal practices and ecological understanding of the areas we used to graze on. The potential loss of the important animal genetic resources that we have developed, in co-evolution with the Rajasthani ecology is significant for a world that is suffering from climate change and food shortages. Our future: the continuing exclusion from areas for grazing raises serious doubts about the viability of our way of life. With it will disappear our livestock, our culture and the virtuous relationship between our herds and the Rajasthani landscapes we have sustained. We require grazing rights and a corresponding increase in the market for our products to continue to sustain our livelihoods and keep our unique breeds, including the camel. Our children no longer want to carry on our traditional way of life because of the hardships associated with the lack of grazing but at the same time are returning frustrated from low paying jobs in cities where they went as unskilled labourers. We are caught in a no man’s land of being unable to carry on their traditional occupations and unwilling to suffer the indignities of life as unskilled labourers. The Biological Diversity Act of 2002 in its efforts to fulfil India's commitments under the Convention on Biological Diversity provides for the conservation of biological diversity, sustainable use of its components and the fair and equitable sharing of benefits arising from the use of such biological diversity and associated traditional knowledge (TK). The Biological Diversity Act sets up the National Biodiversity Authority (NBA) and the Biological Diversity Rules of 2004 lists the functions of the NBA as including regulating access to biological resources and associated TK for commercial and research purposes. The NBA is also empowered to advise the Central Government on any matter relating to the conservation and sustainable use of biodiversity and associated TK and the fair and equitable sharing of benefits arising from the utilization of biological resources and associated TK. The Biological Diversity Act among other things requires the Central Government under Section 36 to promote the conservation and sustainable use of biological diversity through in situ conservation and minimize the adverse effects on biological diversity of any project undertaken through environmental impact assessments that includes public participation.The Central Government is tasked with ensuring respect and protection of associated TK of local communities in accordance with the recommendations of the NBA including registration of TK and other sui generis methods for its protection.Under Sec 38 the Central Government is also required to preserve and protect those species that are on the verge of extinction. In order to ensure the effective fulfilment of the role of the NBA at a local level, local bodies such as the Panchayats or Municipalities are required under Sec 41 to set up Biodiversity Management Committees (BMCs) to promote conservation and sustainable use and documentation of biological diversity and associated TK. The NBA and the State Biodiversity Boards would consult with the BMCs while taking any decision relating to the use of biological resources and associated TK within the territorial jurisdiction of the BMC. Under Rule 22 (6) of the Biological Diversity Rules of 2004 the main function of the BMC is to prepare a Peoples Biodiversity Register in consultation with the local people which shall contain comprehensive information on availability and knowledge of local biological resources and their associated TK. The Biological Diversity Act under Sec 21 envisages that the NBA will base its approval regarding any application for access to biological resources or associated TK on the whether a mutually agreed terms and fair and equitable benefit sharing has been negotiated with the local community that provides such resource or associated TK (benefit claimers according to Sec 2 (a) of the Biological Diversity Act). The local community or benefit claimers in question will be identified according to the Peoples Biodiversity Register under the territorial jurisdiction of the local BMC. The right to carry on the Raika traditional lifestyles which involves continued access to grazing lands in order to conserve the biological diversity of our breeds and associated TK. The preamble of the Forest Rights Act in accordance with Art 8j of the Convention on Biological Diversity recognizes that the forest dwelling scheduled tribes and other traditional forest dwellers are integral to the survival of the forest ecosystem. The Forest Act seeks to address the long term insecurity of land tenure and of these communities and therefore recognizes the rights of forest dwelling tribes and other traditional forest dwellers, which include nomadic or settled pastoralists, on all forest lands. We acknowledge the limitation of these rights under Section 4 of the Act in cases where forests are designated as National Parks or Sanctuaries, but point out that the processes set out under Section 4(2) – such as ascertaining whether other reasonable options such as co-existence are not available - remain to be complied with. The National Policy for Farmers (NPF – 2007) is an attempt to reorient agricultural policy to take a more holistic vision of agricultural production to include a focus on socio-economic wellbeing. Animal genetic resources and pastoralists are among the areas it focuses on to achieve in situ conservation according to the NBA. The NPF acknowledges livestock keepers’ inherent rights to continue to use and develop their own breeding stock and breeding practices and calls on the government to recognize these rights, acknowledge livestock keepers’ contribution to the national economy, and adapt its policies and legal frameworks accordingly. As part of this effort, it underscores the need to document the indigenous knowledge of pastoral communities about animal conservation, maintenance and breeding. Involved of pastoralists in all local natural resource management programs, including village forest committees and joint forest management. Advise the Central Government and coordinate the activities of the State Biodiversity Boards to protect the customary grazing rights of the Raika so as to safeguard our traditional lifestyles that ensure the conservation and sustainable use of the our breed diversity, associated traditional knowledge and the local ecosystem (under section 36 of the National Biodiversity Act). Preserving and practicing our traditional breeding and ethno-vetinary knowledge and innovations, and sustainable management of forest resources relevant to the protection of the co-evolved forest ecosystem of the region. Our traditional breeds represent collective property, products of indigenous knowledge and our cultural expression. Make breeding decisions and breed the breeds they maintain. Participate in policy formulation and implementation processes on animal genetic resources for food and agriculture. Receive appropriate training and capacity building and equal access to relevant services enabling and supporting us to raise livestock and to better process and market our products. Participate in the identification of research needs and research design with respect to our genetic resources, as is mandated by the principle of Prior Informed Consent. Effectively access information on issues related to our local breeds and livestock diversity. We call the Convention, to recognize our contribution to the conservation and sustainable use of biological diversity in the Rajasthan’s forest ecosystem. We also call on the UN Food and Agriculture Organization to acknowledge the importance of our animal genetic resources and to recognize livestock keepers’ rights.